Amidst the fear surrounding Zika virus, remember that there are over 100,000 children born each year with birth defects caused by infection with rubella virus. Rubella virus is a member of the Togaviridae family, which also includes chikungunya virus. 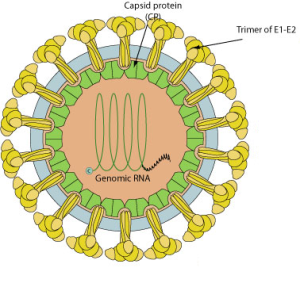 The genome is a 9.7 kilobase, positive strand RNA enclosed in a capsid and surrounded by a membrane (illustrated; image from ViralZone). Humans are the only natural host and reservoir of rubella virus. The virus is transmitted from human to human by respiratory aerosols. Upon entry into the upper respiratory tract, the virus replicates in the mucosa and local lymph nodes. Virus then enters the blood and spreads to regional lymph nodes, where it replicates and a second viremia ensues. The incubation period is approximately 14 days, after which virus is shed by respiratory secretions, allowing transmission to other hosts. The second viremia brings virus to the skin, where a rash appears after 14-21 days. Rubella is a mild disease associated with low grade fever, swollen lymph nodes and a morbilliform rash. Before a vaccine was available, infection typically occurred between 5-9 years of age. In 1942 the opthalmologist Norman Gregg found that many children with cataracts also had other serious congenital defects. He noticed that an epidemic of congenital cataracts was preceded by a rubella outbreak, and proposed that cataracts and other abnormalities were caused by maternal infection during pregnancy. Eventually other investigators confirmed that rubella virus could cause fetal defects when infection of the mother occurred in the first trimester of pregnancy. Congenital rubella syndrome (CRS) is the name give to fetal defects caused by rubella virus infection. These include eye manifestations (cataracts, glaucoma, retinitis), congenital heart defects, hearing loss, microcephaly, bone disease, mental retardation, and diabetes. When a pregnant mother is infected early in pregnancy, the virus crosses the placenta and infects most fetal organ systems. No animal models are available to study how the virus causes tissue damage. Rubella infection may also lead to encephalopathy or encephalomyelitis in one case per 6,000 infections. In these cases the virus can be found in cerebrospinal fluid and in the central nervous system. Rubella virus was the first virus shown to be teratogenic in humans. This discovery hastened development of an infectious, attenuated vaccine, which was licensed in the US in 1969. It is now given to children as part of the MMR vaccine – measles, mumps, and rubella. Its use in the US, and in many other countries, has controlled outbreaks of rubella and eliminated congenital rubella syndrome. The Centers for Disease Control declared in 2005 that endemic congenital rubella syndrome had been eliminated from the US. Rubella is an eradicable disease, because the vaccine produces durable immunity, and humans are the only reservoir of the virus. In contrast, Zika virus probably cannot be eradicated, because there is a non-human reservoir of the virus – possibly non-human primates. Before immunization, rubella was endemic worldwide, with epidemics taking place every 6-9 years, as pools of susceptibles reached a threshold. I wonder if we will see similar behavior with Zika virus, once the initial wave of spread subsides. Like the outbreak of microcephaly in Brazil, the 100,000 children born annually with congenital rubella syndrome is a tragedy. It’s important to remember that having an effective vaccine does not guarantee control of disease – the vaccine has to be distributed to all who need it. Hi, great article and a really important point. I’ve been seeing this figure of 100,000 CRS cases a year in quite a few places and it is indeed huge. Can you by any chance produce an up-to-date reference for the figure? As far as I can tell, the most recent research supporting that figure comes from 2000, which was a year when there was actually a particular epidemic and this was only shortly after the WHO launched a huge push for the rubella vaccine worldwide (in 1998-1999). Now, 17 years later, I expect that 100,000 CRS a year figure is well out of date, but it seems to keep getting quoted.